Students from Burbank and Peterson Elementary Schools in Merced participated in a day of interactive science and engineering hosted last month by UC Merced’s Center for Cellular and Biomolecular Machines (CCBM), a National Science Foundation Center of Research Excellence in Science and Technology (NSF-CREST). Led by professors Victor Muñoz and Ajay Gopinathan, CCBM has a research, education and outreach focus, and actively engages with the local community to promote science literacy and inspire would-be scientists to pursue educational and research opportunities. 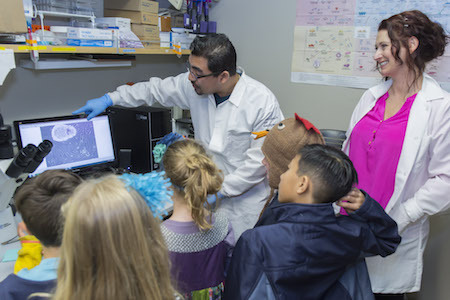 The 75 kindergarten through second-grade students participated in hands-on demonstrations designed and led by Physical Sciences Instructional Lab Manager Donna Jaramillo-Fellin, CCBM staff scientists and UC Merced graduate students. Students explored fundamental scientific concepts, including angular momentum, air pressure and friction. But this wasn’t the typical classroom. Chalkboards and textbooks were replaced by wheel races, air guns, noisemakers and homemade slime. Students learned food science when they made a lemon-lime soda from scratch and explored phase change as they watched liquid nitrogen ice cream being made. Students also visited the laboratories of professors Sayantani Ghosh (physics), Kara McCloskey (biological engineering), Bin Liu (physics), Tao Ye (chemistry and chemical biology) and Muñoz (biological engineering). The budding scientists and engineers were later treated to a pizza lunch overlooking the Merced 2020 Project development site. “The students and teachers had a fantastic time while on campus, and look forward to future visits,” Kouadio said. More than just a day of hands-on learning, the event revealed a world most students would never see in a typical K-12 science class. It was an opportunity for students to take a behind-the-scenes peek at state-of-the-art research facilities located just minutes from their schools. And students experienced it all with distinguished scientists serving as their guides. CCBM also aims to reach a diverse audience through its outreach efforts. CCBM has programs to train K-12 science teachers, providing cutting-edge laboratory experience generally absent from STEM teacher training. And students from Merced College, Fresno State and CSU Stanislaus are provided opportunities to participate in CCBM’s summer research program for undergraduates. Elementary school students aren’t the only ones free to explore CCBM. In September, CCBM will open its doors to the public when it hosts the First Annual CCBM Open House. Information about these events and related opportunities can be found on the center’s website.